Frame Modifications can mean just about anything. Sometimes it just means re-spacing the rear triangle to get from the obsolete 120 or 126mm to the more modern 130mm rear spacing so you can run any modern road hub, or adding dimples to the chain stays for more tire clearance. Sometimes it can mean pulling every braze on off the bike, re-spacing and adding all new braze ons for a new wheel size and drive train. The only limits are what your frame will allow and your imagination! Check our Custom Work Pricing page for specific prices. Here are some examples! A little more tire clearance. Below is a set of pics showing a custom frame dimple tool I made for adding a little more tire clearance on bikes that are already together. 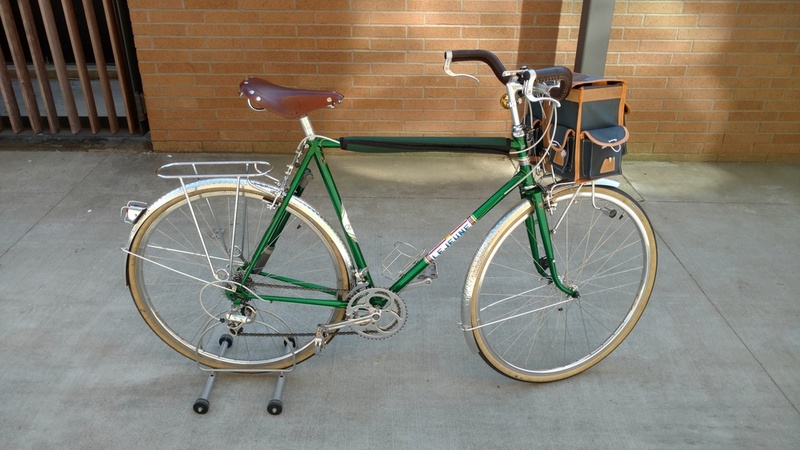 This particular bike was a 700c single speed frame that the customer wanted to run 650b wheels and 42mm tires on. It needed a little squeeze to make such a large tire fit! If you look in the center of the last photo you can see where a 650b x 38 tire rubbed the paint away! With the dimples there is now a safe amount of room to fit 650b x 42mm tires. Gino was sick of forgetting to turn off his battery powered rear light and winding up with dead batteries instead of a light. So he brought his favorite bike in to have a Compass dynamo taillight added. This is Gino's only bike right now so we had to time it with the Painter's work load to get it done asap! 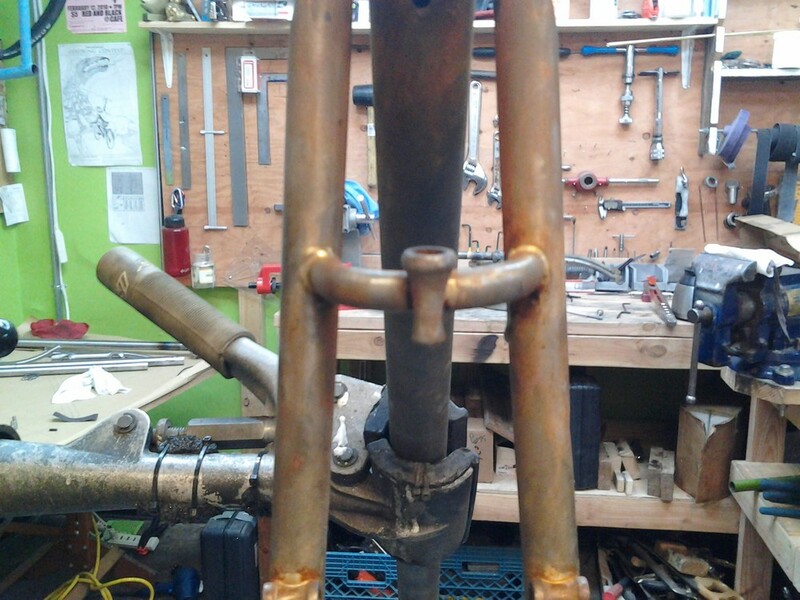 This light requires a special braze on, well brazed on! We talked him into a pump peg while we were at it. 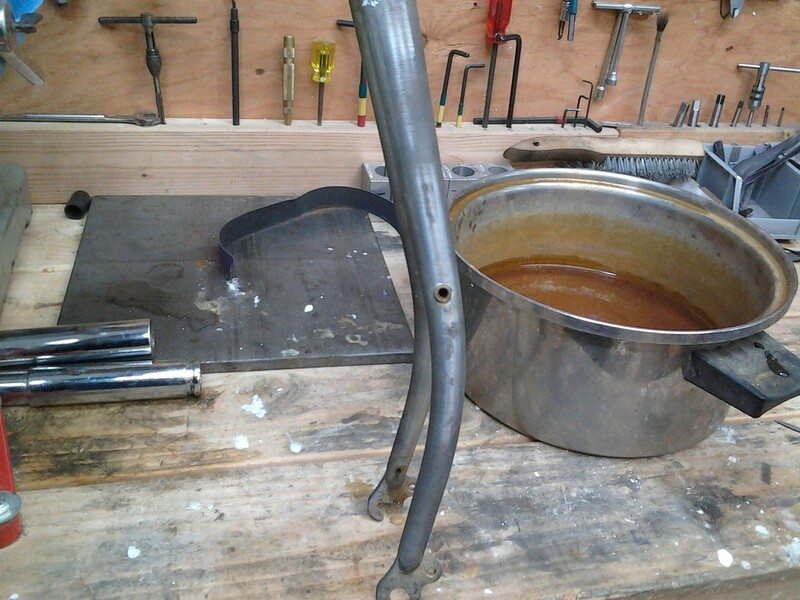 First we had to strip the bike down to the bare frame, and add the braze on without damaging the logos. He then took the frame to Black Magic Paint for some touch up paint work. Then back to us to be resembled. La Grenouille is a collaborative build we did with the graphic designer Karl Edwards. You may be familiar with some of his work, even if you didn't realize it was his. Karl has been doing design work for the cycling industry for more years than many of us have been cycling! He talked me into doing "some" frame mods for him so he could build a real "time capsule" bike. We ended up going a little crazy with it and the bike turned out so nice he designed some wonderful logos and had Keith Anderson give it the full paint treatment. 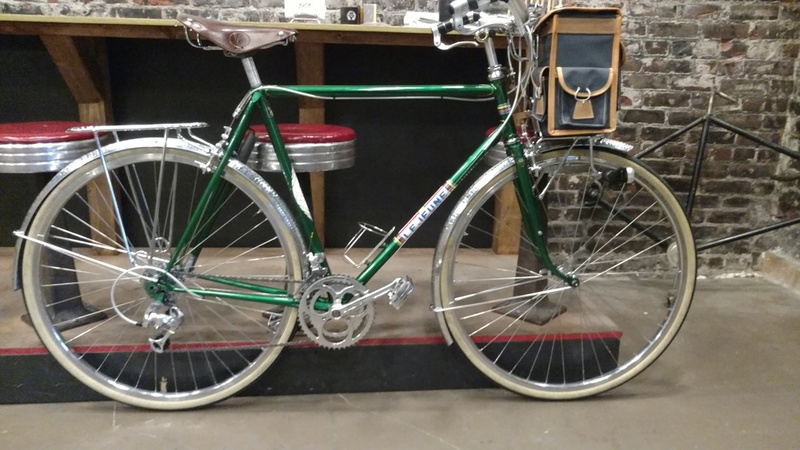 La Grenouille started life as a very nice original Trek. Karl scored it off Craigslist, removed some of the paint and then brought it to me for mods. We really went all out, frame mods include adding studs to hard mount M.A.F.A.C center pull brakes. Rack bosses to affix a set of vintage chrome racks Karl had. Twin pump pegs to hold a vintage alloy pump. A custom made bottle generator plate for an old sidewall dynamo. I removed the original brake bridge and replaced it as well to get rid of the old brake hole and add a simple threaded boss and star reinforcement so that the fender could mount subtly, and invisibly. The old Trek was from the age of bolt on everything so it needed all the standard braze ons too, such as bottle bosses, and cable stops. I also pulled off a vintage frame builder trick and used some old Campagnolo stainless derailleur housing to make tiny wiring guides for the dynamo wires. Here is a picture I posed for at Karl's request the day the bike first left the shop. Ready for a few hundred miles of test riding before being stripped down for paint. 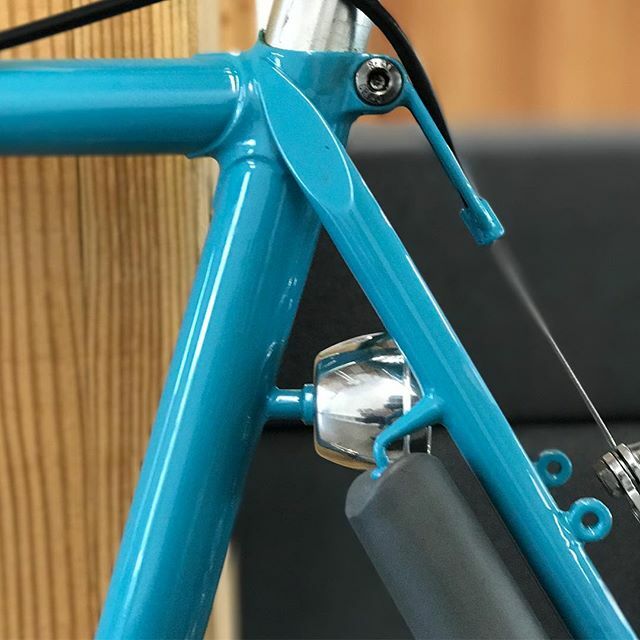 The bike features a vintage build with 1970's Campagnolo Nuovo record components, other than the Simplex Retro friction shifters. The bike also features a hand made decaileur and Gilles Berthoud bags. *You will notice that the rest of the build pictures are form a second much more frenchy build Karl and some friend did at a later date. I stole these photos of the frame in the paint booth from Keith Anderson's Facebook. I was so excited to see a frame I'd worked on appear there! I'd been wanting to have my very detail oriented work exquisitely ornamented in Keith's show quality paint for awhile, but rarely get the opportunity. 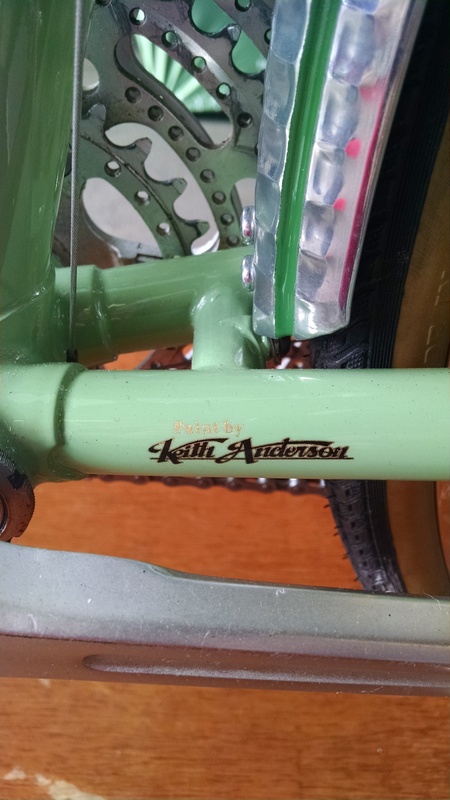 I'm hoping this will be the first of many show bikes that get the Keith Anderson touch! Lovely lug masking and lug lining in gold! Even though the paint, and all the fancy frame modes are super fun to look at the real show sealer for this bike is Karl's amazing frog drawing. I love his work and suggest you check out his web site and blog for more info and posts about making my personal frame building logo as well as many other frame builder's, and bike companies logos. Our friend Jim is tall, very tall (and handsome with a British accent, but that has nothing to do with the story). He has a little trouble finding bikes that fit. There are some tall frames out there, but few with long enough top tubes for him. So when this beat up old rusty low-ish end Bridgestone came along he grabbed it up. This bike is for 700c wheels but not a lot of room for fenders. We did the full run of mods: hard mount studs for center pull brakes, every braze on ever including new curved rear brake bridge and cable stops, adjuster. My favorite mods are the third set of bottle bosses placed on the upper of the down tube, the pump peg, and the curved bridge. Jim rounded out the build with a vintage Shimano 600 group and some V/O stuff. The neatest part are the Zinn 200mm cranks! Mods don't have to be super expensive. I love this one because Jim spent less than a grand on the whole bike. Jim's a great mechanic and works at a shop so he got a great deal on the parts and was able to do all the mechanical work himself including build up the new wheels on the vintage hubs. You can have a really sweet bike for a very reasonable amount if you have a frame that will work for you when everything is said and done, and it's pretty dang fun! We went all out on this one too, new custom low trail fork, handle bar bag rack with detachable lowriders and custom stem! Keith Anderson paint job and a whole lot of mods! Then built ip up with all NOS parts. Very cool.